We all lead such busy lives today; rarely pausing for thought and just taking time to appreciate the environment around us. As a result, it’s no surprise that there has been a huge proliferation in the number of mindfulness practitioners, books and apps, all encouraging us to spend time on ourselves each day. After all, if we don’t, our stressful lives can lead to all manner of health problems. But, how often do we actually take the time to relax? How does fire make you feel? So, imagine walking into a room where there is a flickering fireplace in front of you. How does it make you feel? Evolutionary speaking, fire has played an important role in our development — often at the centre of the home or community, it provided us with a social focal point. And fire still gives us a strong sense of well-being and comfort — there is evidence to prove it. Research scientists in Japan have proved that watching flame movements helps to improve levels of human comfort and satisfaction by observing our alpha brain wave patterns. And in a study for the University of Alabama, Dr. Lynn discovered that watching a fire, complete with sound effects, consistently lowered high blood pressure. The longer people watched the fire, the more relaxed they became, and the experience also seemed to make the participants more sociable. 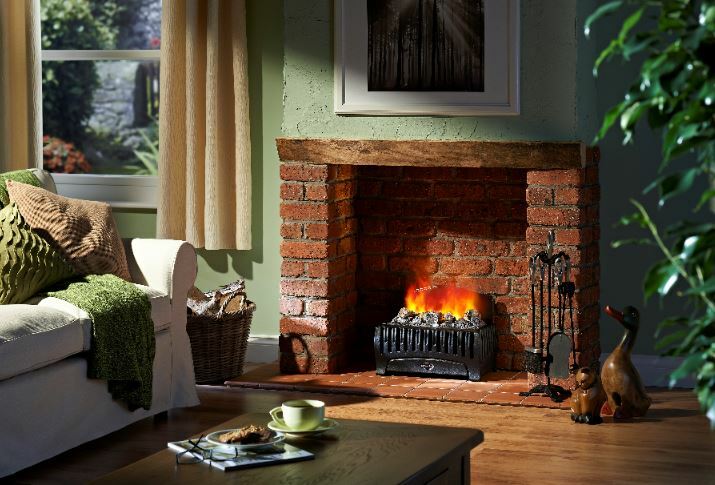 If this isn’t reason enough to promote the benefits of having a fireplace in our homes and buildings, they can also aesthetically enhance a room and provide an ideal focal point for people to gather, relax and socialise. So why aren’t more architects and designers using them in the designs? Despite the benefits, installing a fireplace may not always be straightforward. This was echoed when we questioned architects and designers in our recent research and found that 79% had concerns about using fire and flame within their projects, with health and safety one of their primary worries. There are obvious concerns about having an open flame in buildings, but combustion also leads to carbon emissions and produces particulates. Also, it’s not always possible to have a chimney or flue in some buildings. The good news is that the technology exists to provide all the psychological benefits of a fire without any of the downsides and these benefits can be achieved in both residential and commercial settings. Three-dimensional flame technology gives such a believable illusion that the same state of relaxation and comfort can be achieved as with any real fireplace. Additionally, real logs and crackling effects can be added to mimic the ambience of any real open fire. However, because there is no combustion, there are no open flames, no particulates produced and no need for a flue or chimney. In fact, this flame technology is suitable for any space. So, next time you find your stress ease away as you relax in front of an open fire, remember that this feeling can be recreated for the benefit of residents, employees, guests and visitors alike, no matter the age of the building or where it’s located.